3:15pm Florist arrives to set up table centerpieces and other floral decorations. 3:30pm DJ arrives and sets up equipment. 3:40pm Wedding Coordinator, or designated person, arrives to set up place cards, favors, toasting flutes, cake knife, guest book with pen and basket or other holder for the money envelopes. 3:45pm Wedding cake arrives and is set up. Florist to provide flowers and greenery to the cake designer, who will arrange flowers on and around the wedding cake. 5:00pm Wedding guests arrive & Cocktail hour begins. Waiters serve trays of champagne and hors d’oeuvres to guests. 5:15pm Bride & Groom arrive and are escorted outside to take formal photographs on the lawn. All family members and wedding party gather outside for photographs. Make sure all the family members and wedding attendants know where and when! You don’t want to waste any time trying to track down people to be in pictures. 5:20pm Bride, Groom and family members take formal photographs. 6:00pm Bride and Groom, wedding party and parents of bride and groom gather in side room to “line up” for announcements. Line up in order: Groom’s parents first, then Bride’s parents, flower girl and ring bearer, bridesmaids escorted by ushers, maid of honor escorted by best man and then the bride and groom. 6:10pm Bride and Groom’s first dance. Caterer begins serving champagne to the tables for the champagne toast. 6:20pm Cocktail hour ends & Cash bar begins. DJ announces that dinner is served and ask that all guests be seated. DJ introduces Officiant, or other designated person, who will say the blessing. Name:__________________________________________, who will give the toast to the bride and groom. 7:00pm Bride & Groom cut the cake. Looking for an alternative to the traditional cake cutting song? Try “It Had to Be You,” by Harry Connick, Jr.
7:15pm DJ announces Bride to dance with her father. 7:25pm DJ announces Groom to dance with his mother. 7:40pm DJ plays song (ex. Crazy Love, by Aaron Neville). 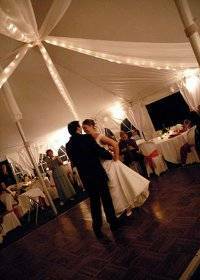 Bride and Groom and wedding party dances & DJ invites all guests to join in. 7:45pm Cake and coffee are served to guests. 8:00pm DJ announces the Bride’s bouquet toss. A nice alternative to the bouquet toss is for the Bride to “dedicated her bouquet” to someone special – maybe her mother or best friend. The bride can say a few words and then give, not throw, her bouquet away. This is a very tasteful and sentimental alternative, and be prepared for a few tears. 8:45pm Bride and Groom’s last dance. 9:00pm Bride and Groom say goodnight and leave for honeymoon destination or hotel. You’ll find even more great ideas for ensuring your wedding goes to plan in my free wedding planning newsletter. Don’t be scared of the planning; subscribe to my newsletter, for free, and let me guide you through the process of creating the fabulous wedding you’ve always dreamed of!